Two years ago, Elfman gave us Vera which was based on some clues containing lies: it tripped me up. This week we had a helping of John and his Revelation. A quick read of some of the verses in my Authorised Version, and I hoped that Elfman would be slightly more comprehensible. 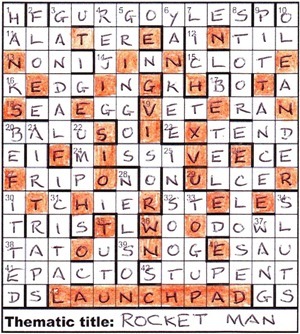 Clues this week were normal, but the initial letter of answers not beginning with A, E, I or O (vowels in the title) would determine the character in the clue which would spell out how to find the thematic title to go under the grid. That seemed straightforward enough, but the start of the preamble — “To illustrate the theme, solvers must highlight one entry and 39 cells containing an associated series of words, all sharing the same axis of symmetry” — seemed fraught with danger”! Starting on the clues, I was encouraged by 3ac Nasty ugly ogres which was a neat &lit for GARGOYLES, except there was a U instead of an A. A quick check in Chambers revealed the alternative spelling GURGOYLES. It seemed appropriate to try the downs next, and 2 FLOE, 3 GANDALF, 4 REJIG and 5 GRINGOS were soon slotted in. For 5 Game’s outside sound clearly for foreign speakers? (7) I assumed that the apostrophe would count as a character, but what about the space? If that counted as well, then this clue did, in fact, contribute a space. Interesting. Solving went very fast here, and within thirty minutes, I had the top five rows complete. I also had gttpot and toleoimeo as the characters from the first few across and down clues, assuming spaces didn’t count as characters. If they did, then I had Use hig and ells on o, and it looked as though “highlighting” and “cells” would come into the equation. I should have expected that the bottom half of the grid would be nowhere near as easy as the top five rows, but I managed to continue solving fairly steadily. Just over an hour later, and I could decipher the message spelt out by all the characters extracted form the clues. It read Use highlighted cells on other clues. Hmmm… I was being thrown back to that tricky first sentence in the preamble, and I needed to determine which entry needed to be highlighted and then find a whole host of other cells. Anyway, this solver proceeded to indulge in his fair share of the activity on and off over a couple of days. Obviously identification of the entry that contained a relevant word was a good start, and while it was probable that it would be centrally placed, either horizontally or vertically, I felt this wasn’t 100% certain. MISSIVE in the centre of the grid seemed a plausible word, perhaps relating to the Epistles in the Bible with their saintly connotations. Also, the thematic title we were looking for had ten letters, and APOCALYPSE seemed made to measure. Of course, it hadn’t passed me by that the John in the title could be any one of a number of Johns, not just the bloke who supposedly wrote The Book of Revelations. Indeed, John Lennon and Elton John seemed possible contenders. I was especially drawn to the former since Ringo was in 5dn GRINGOS, and LENNon could be seen diagonally in the right of the grid. Despite sitting in an appropriate place at the bottom of the grid, LAUNCH PAD did not attract my attention much at all. This oversight could have been my downfall and, not for the first time this year, panic was beginning to set in. As I stumbled (yes, that seems an appropriate word) onto the solution, I wondered how everyone else found their way in. For me, it was seeing the T of Tutu and the W & O of WoOdowl fairly close together that sparked a couple of thousand synapses into action and enabled the penny to drop. The simple word TWO was all it took, and there in the other nine rows were the cardinal numbers from TEN down to ONE. I suspect that the endgame took solvers anywhere from ten seconds to ten days to sort out. I was lucky that it probably only took a total of about two hours off and on. So thanks to Elfman for an excellent puzzle with its simple idea, implemented in a superbly thematic way. This entry was posted on 3 July 2015 at 4:00 pm	and is filed under Solving Blogs. You can follow any responses to this entry through the RSS 2.0 feed. You can leave a response, or trackback from your own site. I love your rocket launch!